"I absolutely enjoyed it! Minus the Prairies, it was fantastic, and a once in a lifetime experience. Which answers my next question... I absolutely would not do it again. I am glad I did it once, but I just can't see going through all that again." "So I have come to the end of my journey, maybe my next one will be with my bike maybe not... but I do know there will be a next one.... :-)"
Well the stars lined up to offer me another journey, and enough timed has passed that I am looking forward to 4 weeks on the road on another motorcycle. I sold my last project house in Toronto, so for family reasons have decided to try and work in Vancouver. My work has agreed to a three month trial of me working in our head office in downtown Vancouver. So with no mortgage, once again, I have the opportunity to take a month, give or take, and ride from Toronto to Vancouver. My Triumph Tiger is long gone, eventually replaced with my current bike: a 2004 BMW 1150GS Adventure, that used to belong to George Stroumboulopoulos. The motorcycle coincidentally, and fortuitously, I LOVE!! 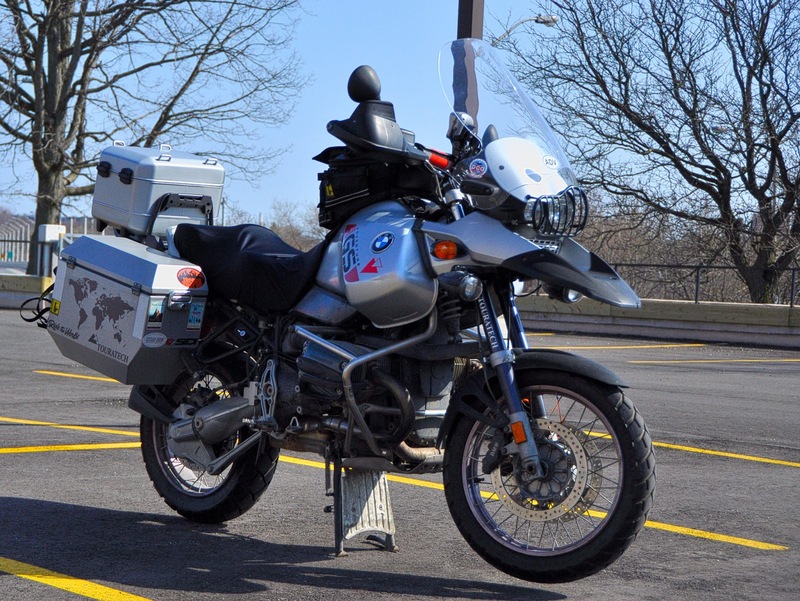 It is a monsterously huge, off road capable, touring bike, that I have upgraded with all the farkles that you need to travel in comfort and carry everything you need to be self sufficient. Just so you get a sense of scale, the top of the windshield is nearly six feet tall!! So I am currently, patiently, waiting for the end of the month, and warmer weather. So give or take a day or so May 1st I should be heading out. My route is ethereal and mutable. I have certain places along the way that I want to see, but how and when I get there, and where I stay along the way is unknown. My muse for my route is a map, ironically. I have a large decal on one of my aluminum panniers, it is a map of North America, with all of the provinces and states in outline. 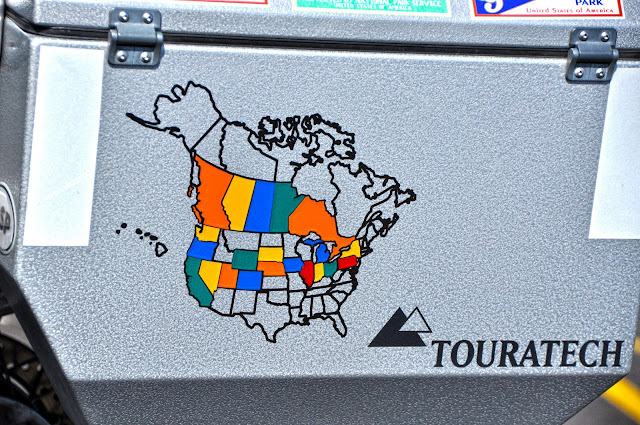 When you drive through a state or province you can fill in the decal. So having done all of the provinces west of Quebec, and most of the northern and western states, I will start my travels to the West coast by heading east!! I will head into Quebec, then south into the USA and over to the east coast, following the coast line down to North Carolina before I start heading west.